I am feeling a bit like Health Care Reform... I keep setting deadlines that keep getting pushed back because complicated things take longer than you think they do. But, right or wrong, even complicated things get done eventually, if you keep working at them. My deadline is to get back to Florida so I can sail the Blue Moon back to New York. I'd actually hoped to be back by spring (ha! 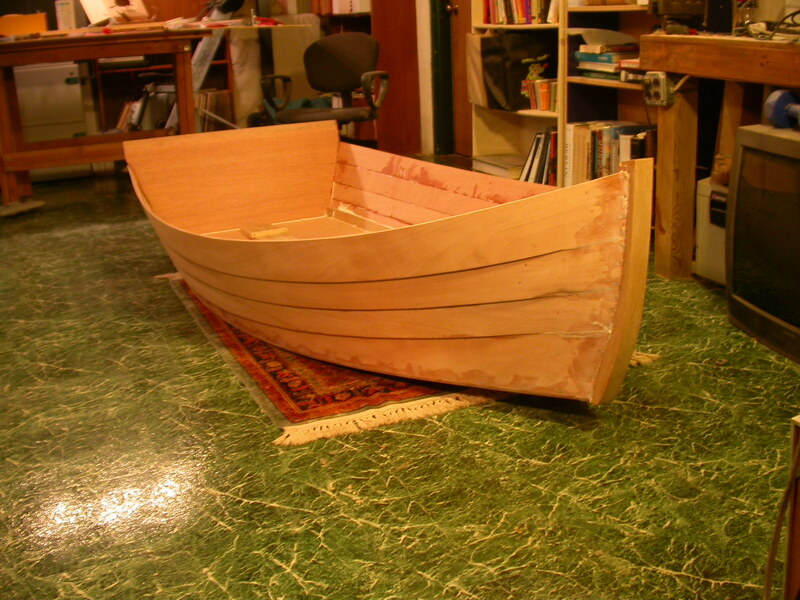 ), but another little boat -- Cabin Boy -- has been keeping me busy. More sane people would have given up and bought a cheap plastic boat for the journey, but somehow it just wouldn't feel right to exclude Cabin Boy from the trip. 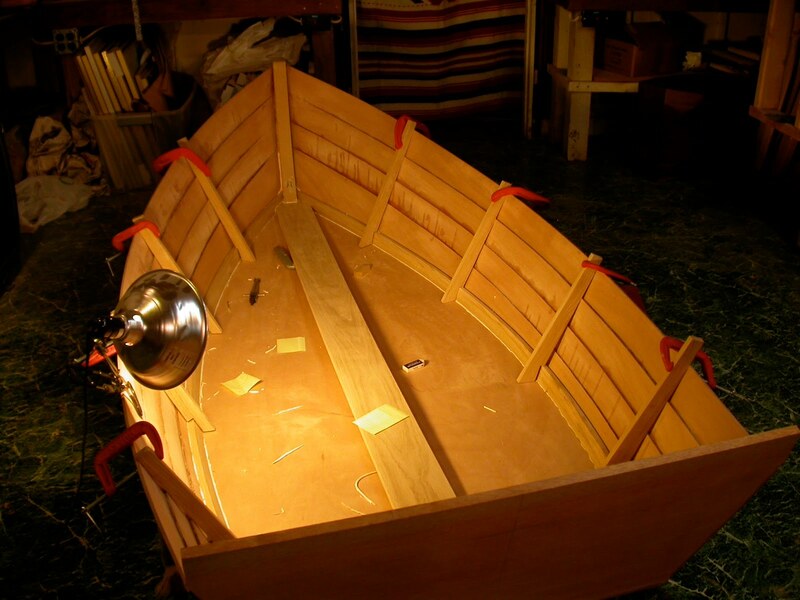 After all, he's more or less responsible for it, since I doubt I would have had the nerve to buy a big(ish) wooden boat without the experienced laid up by building this little skiff. Anyway, the proper subtitle to "The Voyage Home" will be "Cabin Boy's Big Adventure", so I am pressing to finish him. 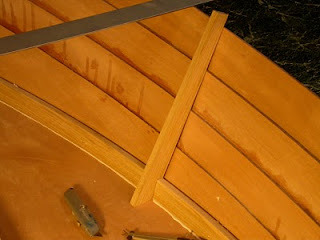 In fact, I've become a full time boat builder... if you call working 12 hours a day 'full time'. Helena and I are committed to tying Cabin Boy to the roof of our old Jeep this Friday morning, so this week's blogs will be short on text, but with interesting pictures. As usual, the blog is running behind the build, so will also try to catch up. First, it was time to flip Cabin Boy over and work on the interior. 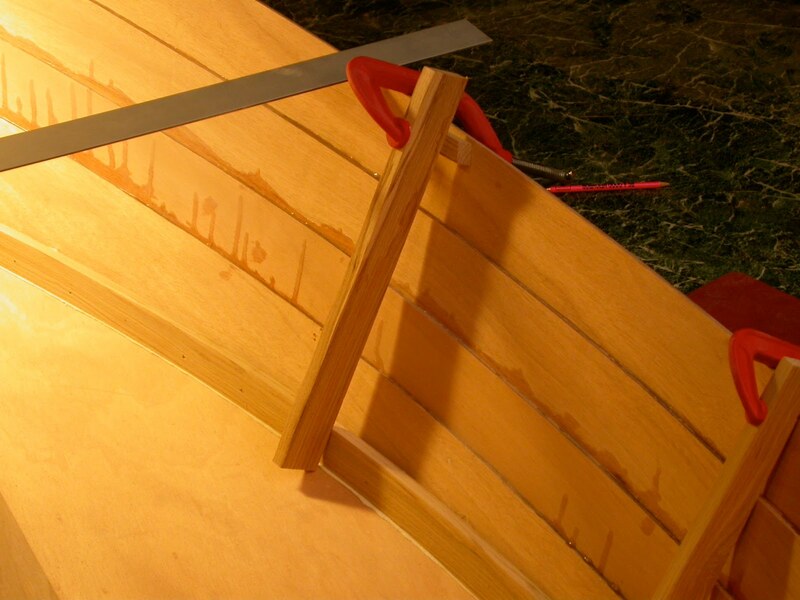 All that in the bow is epoxy smear. It's just discoloration... i.e., it isn't as bad as it looks, but the next time I build a boat, no epoxy! 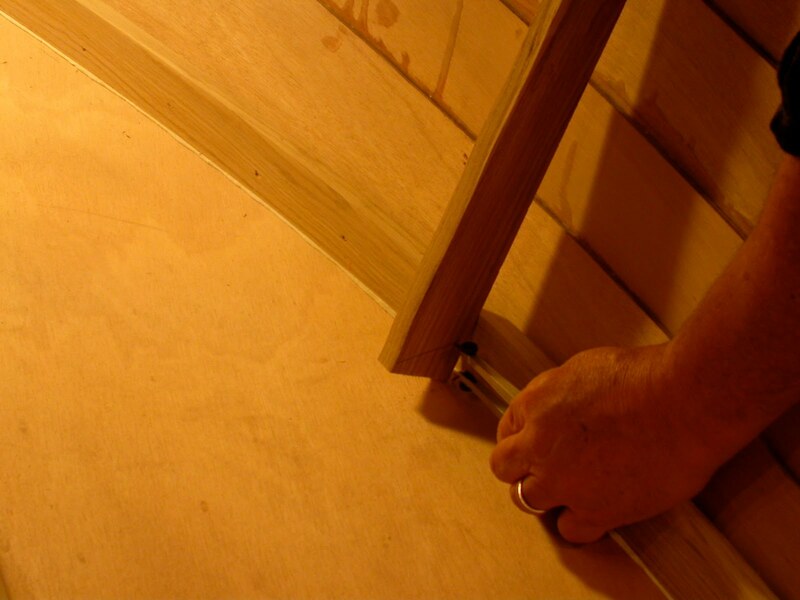 The next thing to do was to fit the 8 ribs that stiffen the sides and that will eventually hold the seats up. It's hard to tell from the photo, but there is a small block, the same thickness as the chine log, clamped under the rib to keep the rib a the right angle. 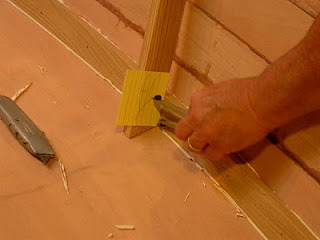 Greg Rossel says to 'scribe' the cuts you need to fit the rib into the side. I had absolutely no idea how to do this. If I had more time, I'd entertain you with the goofy things I tried. Suffice to say they included tying to spile the chine log points onto the rib. 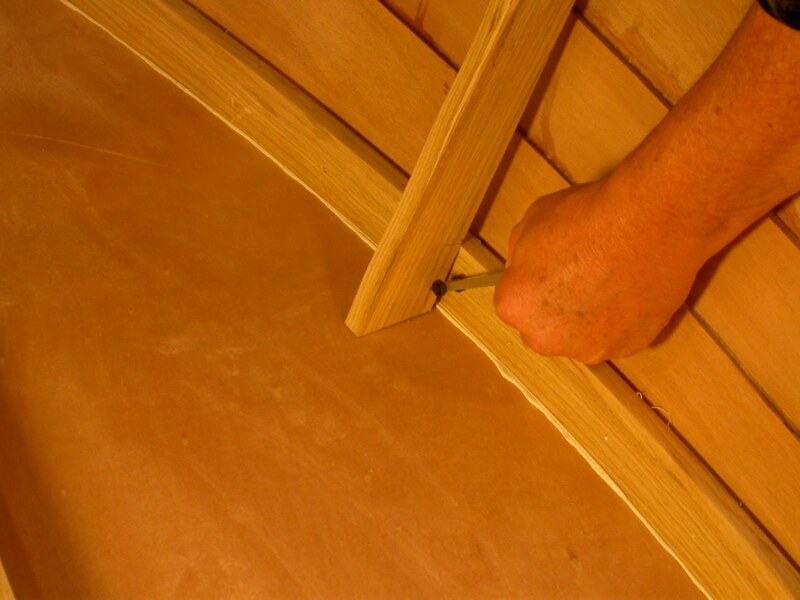 Spiling the points - don't try this at home! This actually sort of worked, but the snow would be falling before I finished them in this way. Eventually, I came to my senses and tried to figure out how to 'scribe' the lines I needed. But try as I might, I could not do it accurately with my plain vanilla compass. The various adjusting knobs got in the way. What I needed was a foot extension. I made one out of a bent nail. Actually, I had to try several nails before I found one that was 'just right', and the one I used was a bit longer and not bent at such a right angle... more like 45 degrees. 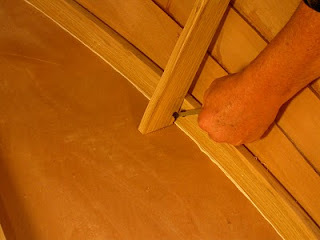 With the right tool, I was able to scribe the base of the rib. 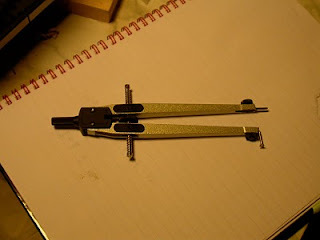 Basically, you just hold the nail end of the compass on the floor, and the pencil end on the rib, keeping the nail and pencil vertically aligned, and just move the compass along the floor to draw the line. It takes a bit of practice, but easy-peasy. Not much harder is to scribe the chine log cutout. Again, I am just holding the compass for the photo. When actually scribing, you should hold the compass perpendicular to what you are scribing, or as close as possible. I always forget the details when that 10 second camera timer is ticking down! If you click on the photo, you should be able to see the shape of the chine log penciled onto the rib. One important point!!! Your compass must be set to the thickness of the chine log for this to work. Looks easy, right? Actually, this was the 7th rib I cut, not the first. The first one took over an hour and didn't fit particularly well. But I gradually got better at it, and this last one took about 15 minutes, from cutting out the blank, to sanded rib. And here they are, all clamped on for show. It's amazing how these ribs make the boat look hefty and substantial. 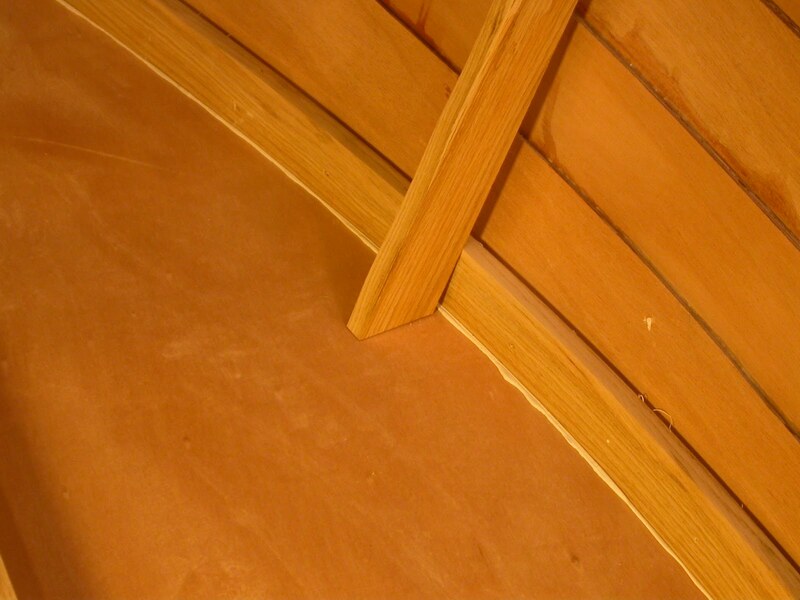 I decided I'm going to paint the plywood, and just oil all the oak bits with linseed oil. That's it for today! Tomorrow, breast hook and knees! I've been following your progress with interest John. I built a "Whisp" skiff by Steve Redmond last year and followed a similar learning curve.